Aparthotel Adagio Frankfurt City Messe, opposite Frankfurt exhibition center, offers accommodation in Frankfurt/Main with a spectacular view of the Frankfurt skyline. Guests benefit from free WiFi in all areas and a 24-hour front desk. 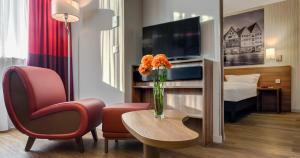 All apartments include a flat-screen TV with satellite channels, a work desk and a bathroom with bath and shower. Additional facilities available on site include a laundry service (at an extra cost) and a business corner. You can prepare your own homemade breakfast in your apartment. Or if you prefer, you can enjoy a buffet breakfast, served each morning in the property's breakfast room for a small surcharge. Fair Frankfurt is 200 metres from Aparthotel Adagio Frankfurt City Messe, while Messeturm is 300 metres from the property. The nearest airport is Frankfurt Airport, 9 km from the property. For stays of 8 nights or more, a weekly cleaning service is included. For stays up to 7 nights, an optional cleaning service is available on request. This studio has a dining area, kitchen and cable TV.